It's HERE!!! 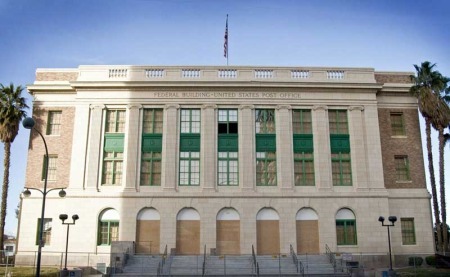 Be sure to get your tickets, it sounds like a wonderful way to connect with Las Vegas' post-war history and its architecture!!!!! We are thrilled that the ADAS (Architectural and Decorative Arts Society) has carried on the Mid Century Modern celebration that we started a few years ago. If you love the Mid-Century Modern lifestyle, history, architecture, own a mid-mod home or want to take a tour of mid-mod homes in Las Vegas, this is the event for you. 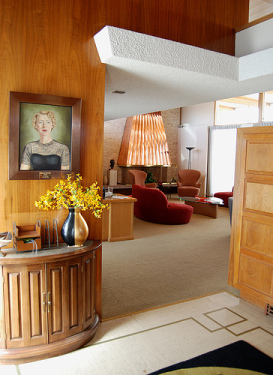 Tickets to the Las Vegas Mid-Century Modern Weekend are on sale now. things mid-century modern with an extraordinary five day event. is limited on most events. be included in the price of the mixer. evening, or can return at a later date. area, along with vendors previewing products that were popular in the '50s and '60s. 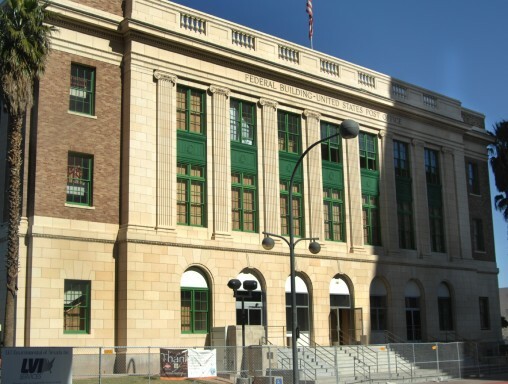 Again at the Atomic Testing Museum, ADAS is hosting a seminar primarily for homeowners on the evolution and care of these historic buildings. Speakers with hands on experience in this genre of distinctive houses will share their knowledge. Food and wine will be provided. Vendors who specialize in mid-modern architecture will also be on hand. Time: 6:00 – 8:00 pm. reception at the Morelli House. on American life in the middle of the 20th century. 2:00 pm “Family Feud: Havana vs. Las Vegas in the 1950s” Peter Moruzzi, presents an illustrated presentation from his book, Havana Before Castro-When Cuba Was a Tropical Playground. Before Castro’s revolution, Havana and Las Vegas were rivals for the title of the “Monte Carlo of the Americas.” Cuba’s exotic tropical setting, wild reputation, close proximity, and supportive government inspired the mob to invest heavily in fabulous hotel-casinos such as the Capri, Riviera, and Nacional. Yet, many of these same investors were also among Vegas’ biggest boosters - Moe Dalitz, Sam Tucker, and front man Wilbur Clark. In 1958, the Nevada Gaming Control Board forced them to choose, Havana or Las Vegas, but not both. drink and refreshment at the Morelli House, 861 E. Bridger. bus through iconic mid-century Las Vegas neighborhoods. Mall. Time: 12 noon – 4 pm. Should be a lot of fun as well as informative. So if you love mid-century modern, get your tickets NOW!!! Got a Moe Dalitz Story? In his later years he was known for his philantrophy, in his younger years he was a member of Cleveland's Purple Gang, in his mid-years, he was the mob's man in Las Vegas. 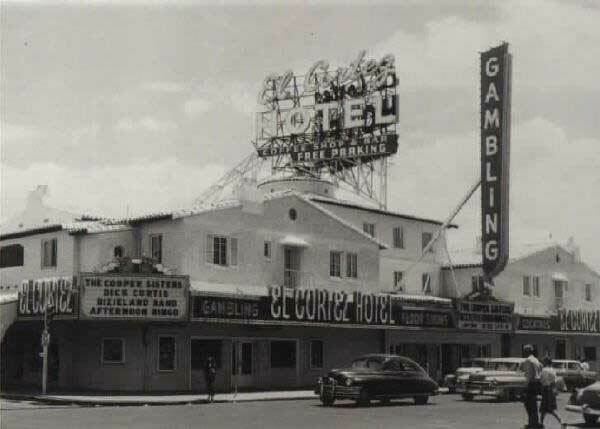 When Wilbur Clark fell into financial problems with the Desert Inn, Moe helped him out and, in doing so, got controlling interest in the hotel. 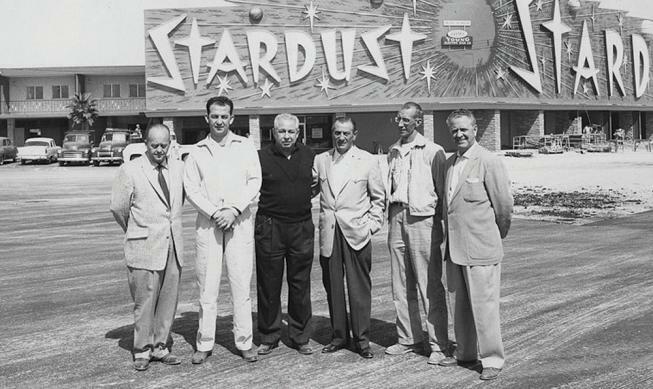 When Tony Cornero ran into financial problems while building the Stardust, Moe was there, all to happy to help out. When Cornero took his gambling jones too far at a craps table one evening and dropped dead, Moe and company saw their chance to take control. Moe was the go-to man throughout the history of the Las Vegas Strip in the Classic Las Vegas era. He saw a chance to cash out with a bundle when Howard Hughes told Robert Maheu to go tell Moe that Hughes wasn't leaving the Desert Inn penthouse in time for the New Year's celebration of 1966. Moe said he had to go. When push came to shove, Hughes bought the hotel and Moe was, in the end, financially, a happy, happy man. He was always philanthropic, like many of the old casino operators were. They knew that giving back to the community was a way to keep that target off their back. He helped build Sunrise Hospital. He worked with Irwin Molasky to build the Boulevard Mall and Paradise Palms. Over the years, he burnished that philanthropic halo as much as he could. If you knew Moe or have stories about Moe, John L. Smith at the Las Vegas Review-Journal wants to hear from you. He is helping gather stories about Moe because Moe's daughter, Suzanne Dalitz- a journalist in her own right, is writing a book. So, if you knew Moe or have stories about Moe, contact John L. here. Sixty years ago today (Monday, Nov. 15th) , Senator Estes Kefauver and his committee came to Las Vegas to further their investigation into organized crime. Kefauver was a Senator from Tennessee. In 1950, he began an investigation into organized crime. The committee was officially known as the Senate Special Committee to Investigate Crime in Interstate Commerce but quickly became known as the Kefauver hearings. Kefauver and his committee (and the press) traveled around the country from Kentucky to the Mid-West to Nevada in their quest for more information on the mob. They traveled to 14 cities and interviewed over 600 people including Frank Costello. Costello made himself famous by refusing to allow his face to be filmed during his questioning and then staged a much-publicized walkout. By televising the hearings at a time when Americans were just beginning to buy televisions and were entranced by the box, Kefauver brought the idea of organized crime and the mob into the homes and appliance stores of Americans around the country. 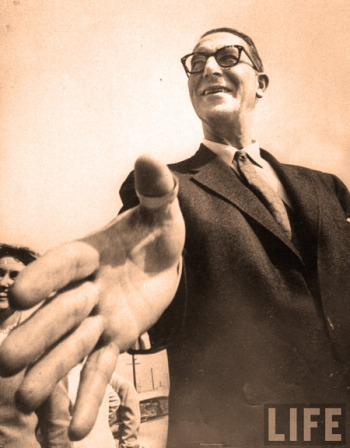 Kefauver rode that wave of popularity and ran for president twice. By the time Kefauver and his committee rolled into Las Vegas via train, they had a list of interviewees that included Wilbur Clark and Moe Dalitz among others. 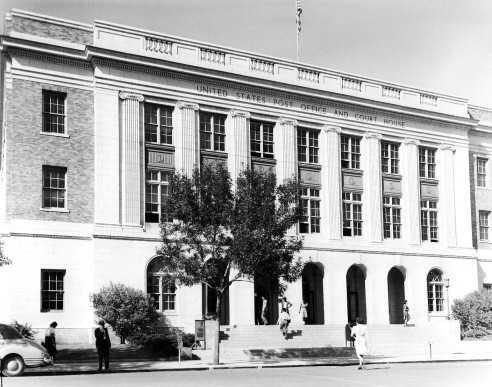 They convened in the Federal courthouse and post office. 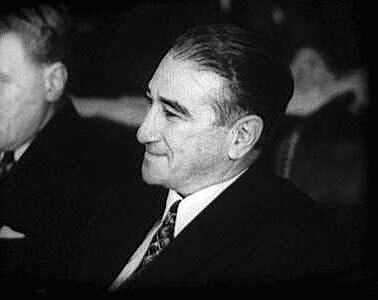 Dalitz was quoted as telling Kefauver and his committee who criticized him for being a bootlegger, "If you hadn't have drunk it, I wouldn't have bootlegged it." After two hours, the committee adjourned and went on a field trip to Hoover Dam. which had little or nothing to do with organized crime but is one of the great architecural marvels of the 20th Century. The aftermath of the Kefauver hearings did have an upside for Las Vegas and Nevada. The other cities that were involved in gambling, it was illegal there. Here in Las Vegas (and throughout Nevada) gambling was legal. 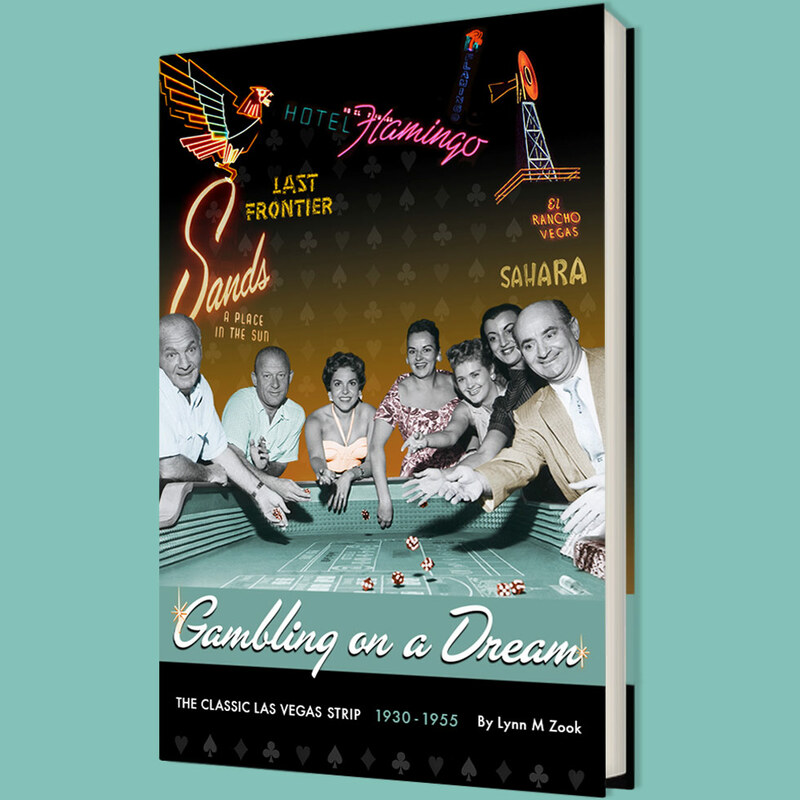 Organized crime began to seriously look at Las Vegas as their headquarters for gambling and over the next few years that relationship grew and took on more importance than Estes Kefauver and his committee ever intended or ever realized. It would be another 30 years before Las Vegas was able to break the mob's hold on Las Vegas. To honor this event, the people behind the Organized Crime and Law Enforcement Museum ( better known as the Mob Museum where the hearings were held) are having a media event. Mayor Oscar Goodman (for those who love irony, Goodman as a mob attorney defended his clients in the courthouse) and others will be in attendance.